I’ve learned to live on very little money in order to support my lifestyle as an artist. I haven’t had medical insurance since 1985 and luckily I’m very healthy but whenever I have needs, such as dental work, and once, a doctor, I asked around and found someone I could barter with. I’ve bartered for airline tickets, amazing places to live, places to stay while I’m traveling overseas and this continent, and car repairs. I usually barter my art, but I’ve met people with skills such as massage, hairstyling, jewelry making, and bookkeeping, to name just a few, who have done well with barter. If you are willing to work, create art, or have something to trade, then you’ve got something you can barter with. I’ve found that there are many times people might not want to spend money but will barter. When I quit my systems analyst job and didn’t want to be stressed out about money, as a single person I learned that caretaking other people’s property allowed me the freedom to make my art. This lifestyle has landed me in extremely beautiful places, with my rent, utilities and, depending on the situation, food, salaries, vehicles, and use of swimming pools, as part of the deal. On this blog site I intend to tell my stories as well as those I’m collecting from other people, and pass on some web sites that will help you meet up with other people interested in bartering. In my twenties I traveled around the world and found wonderful opportunities for work exchanges along the way. In Australia I lived for a couple of years in the outback where I rented a house on a two hundred acre farm for the low rent of $80 a month in exchange for keeping an eye on my landlord’s cows. In Bodh Gaya, India I spent a couple of weeks in a Thai Buddhist monastery, in exchange I spent an hour a day helping one of the monks with his university studies. In Israel I lived on a kibbutz for three months and did a variety of jobs in exchange for everything I needed. I learned that honest, loyal, hard working people were really appreciated and could get jobs anywhere in the world. In my thirties I finally settled down and worked as a computer programmer until I sold two of my short travel stories to a magazine and a piece of art that I’d created was accepted for an important juried show the City of Los Angeles was sponsoring. I quit my job and began looking for ways to survive as an artist, which in L.A. meant long-term house sitting and scenic painting for movies. In my forties my first creative work exchange was as a scenic painter for the New Hope Theater in Pennsylvania. I spent the summer painting sets in the Pocono Mountains while living in a beautiful resort hotel. I stayed for two months in an apartment in Venice Beach, CA in exchange for doing all the black and white still photography for a video project an artist friend was working on. On vacation in Jamaica I met a woman who lived in a beautiful villa on a hillside overlooking the Carribean and ended up house sitting it for a week when she had to go away. While there I learned wood carving from a local artist. One of my favorite work exchanges was for a real estate investor in Bel Air, CA. For three years I worked two days a week as his office assistant in exchange for a salary and a nice little apartment in one wing of his house. I had full use of the grounds and swimming pool. It was while living in Bel Air that I began carving large sculptures for the Treepeople Park in Beverly Hills. 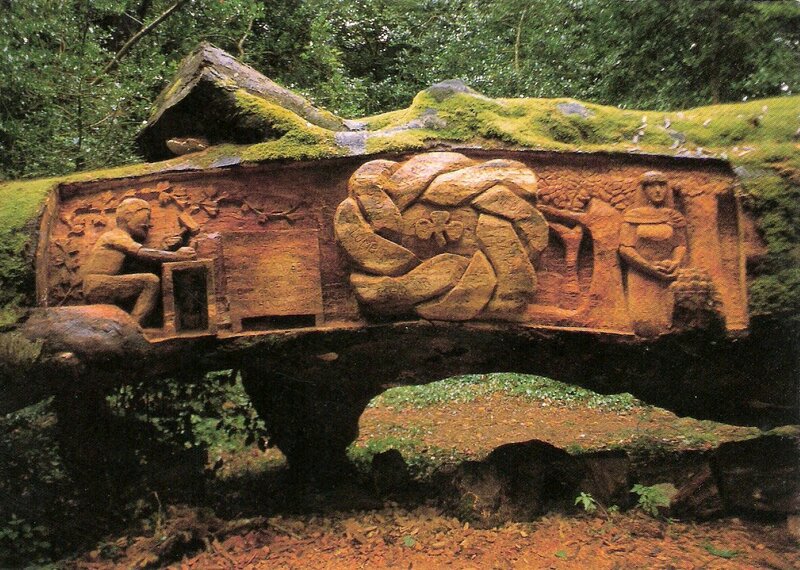 I finally left Bel Air to do a summer work exchange at the Avondale Forest Park in County Wicklow, Ireland where I carved a large sculpture (see photo above) from a famous tree that had died. After this experience many of my work exchanges were art related. Several times a week I will update this site with these stories and many more. I’m hoping to interview Ryan McDonald of The One Red Paper Clip fame, have a piece on house swapping, do an article on business barter sites, and much more. Don’t get me wrong, money is great, but if you don’t have much, there are alternatives with bartering. World travel, living in millionaire homes, the sky’s the limit on what you can manifest.